ON HIS SIDE: YEARS of culinary training and restaurant experience, plus an assistant to help slice and dice. ON HER SIDE: THE power of Mama. That put Alan Wong, chef extraordinaire, and Espy Garcia, Plantation Village volunteer, on equal ground. » Place: Alan Wong's Restaurant, 1857 S. King St. The occasion was a pinakbet cook-off, or rather show-off, as the idea was for Garcia to show off the recipe learned from her mother, and for Wong to show off how such homegrown flavors could be kicked up for fine dining. Wong will do this with more than a dozen plantation-era dishes for "Back to the Roots," a benefit next week for Hawaii's Plantation Village. The menu will include lechon salad, saimin, bean soup, kalbi and poi stew, all fancied up the Wong way. After all, you can't expect a guest to put up $125 to scoop pinakbet out of a communal bowl. To prove the concept and promote the fundraiser, a demonstration was set up two weeks ago in Wong's Pineapple Room kitchen. Garcia arrived armed with precut vegetables and a big pot; Wong with precut vegetables and sauté pans. Side-by-side, the cooking began. Garcia tossed a handful of dried shrimp and a dash of water into her heated pot. "When you throw the water in, it's supposed to sizzle. If it doesn't sizzle -- not hot enough yet. That's Mama's secret to lock in flavor." "When the food is ono, I kiss the cook." Many times would she invoke Mama -- that would be Marina Gabriel, wife of Cecilio, who raised six children, first in the Philippines, then on Kauai, then in Waipahu. Garcia said her mother, who died in 1974 at age 80, fed her family with vegetables grown in every spare inch of dirt around their plantation-camp home. She made everything from scratch, including bagoong ("heavy-duty kind") and chicaron, or fried pork rinds, both used in her pinakbet. "Once in awhile she'd buy a leg of a cow from Kahua Ranch. She would burn off all the hair and the hoof -- I call it the fingernail -- and she would make soup with tamarind." Garcia has the benefit of a supermarket, so her ingredients are mostly store-bought, but the technique is Mama's. Over the shrimp in her pot went cherry tomatoes, onion, ginger, garlic, bagoong, long beans, lima beans and bittermelon. Then she pulled out a plastic bag filled with eggplant that had been soaking in water. "Why you put the water?" Wong asked. "Keeps the eggplant from getting brown. That's what my mama did." Except for a gentle stir at the beginning, the layers of vegetables should not be touched with a spoon, Garcia said. "The magic is, you don't stir." This keeps the vegetables from breaking up. Instead, you "intalta" -- turn the ingredients by picking up the pot and giving it a firm toss. She used to cook in a big cast-iron pot, until she suffered an intalta shoulder injury in 1991. "I popped it. I had to get surgery for that. So now I use smaller pots." OVER ON Wong's side, a smaller portion of pinakbet was under way, a vegan version using organic soy and vegetarian stir-fry sauce. He placed his ingredients in a cold, dry pan, then put the pan over high heat -- a technique that would evenly steam the vegetables rather than create a hot sear. To prepare for the benefit dinner, Wong studied up on the plantation era of Garcia's parents. "When you're only making $9 a month you can't afford a lot. You have to make tofu, trade for squash; bake bread, trade for eggs. You make do with what you have," he said. "Not every cook can do that these days. They freak out if they can't get the right ingredients." But back then, all cooking was grounded in reality, the main one being people were poor, Wong said. They ate vegetables they grew at home, and little protein. "The chicken was either the loser at the cockfight or the one too old to lay eggs." 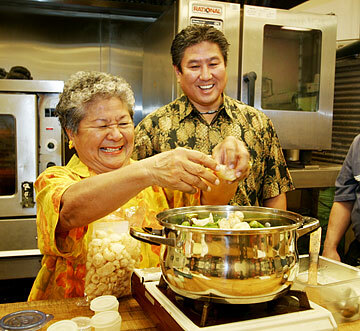 Chef Alan Wong surrenders his kitchen to Espy Garcia as she adds pork rinds to her family recipe for pinakbet, a dish that incorporates a variety of vegetables. Thus came chicken and papaya soup -- the papaya's natural tenderizers making something succulent of a tough old bird. Everything for a reason, Wong said. It's why you don't stir the pinakbet, why the ingredients go in the pot in a certain order. Shrimp first, Garcia interjected: "Or no more that flavor underneath that comes permeating through." Innovation is crucial in a contemporary restaurant, Wong added, but a chef will make a mess of it without first understanding the reasoning behind tradition. "Let's go back in time now, because nothing was wrong before," he said. "Our style of cooking happened a long time ago, we're just making it fancy. This is just one way a chef or a cook can get inspired by looking at the history books. ... We are reinterpreting. I interpret what Grandma and Grandpa used to do." THE PINAKBET'S done and the tasting forks come out. Garcia's dish is soft, pale and fills a large platter. Wong's is colorful with deeper flavors, in a pretty single-serve bowl. But it's all good. "It's for the soul, it's comfort," put on the table to satisfy, Wong said. "With Mom and Grandma, the intent is to nourish and make happy." If anyone can speak to that, it's Garcia's husband of 52 years, Marcelino. "He says God made the stomach and the heart close together, so if the stomach stays happy, the heart stays happy." Garcia, although from a large family, doesn't have children, so who does she cook for? "Everybody, and give away," she said. She volunteers at the Plantation Village on Mondays, which means cooking on Sundays after church. She might bake bread pudding, roll three types of sushi, fry noodles and cook up some Portuguese bean soup, or adobo, or pinakbet, or all three, to take and share. Mama's lesson: "Always remember, smell and taste. Knowing this I could cook for two or 10 or any number." 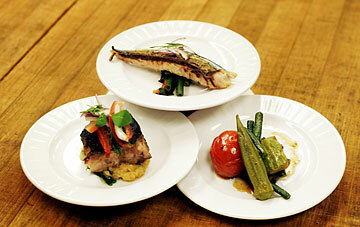 Alan Wong's versions of adobo, left, "sardines" (actually akule confit), top, and pinakbet. » From the Filipino quarter: He's got adobo, but it's a pork steak, cooked through on a kiawe grill, then braised in adobo's ginger, garlic, soy sauce, vinegar and patis. His Lechon Salad will be topped with akule slow-cooked in oil and trimmed to look like a sardine. His pinakbet will be vegan, with pork rinds on the side. » From the Japanese: "Fish and rice," or mochi-crusted opakapaka. » From the Chinese: Bao filled with short ribs and foie gras. » From the Portuguese: A vinegared duck leg with eggs and rice takes inspiration from Vinhas d'Ahlos. 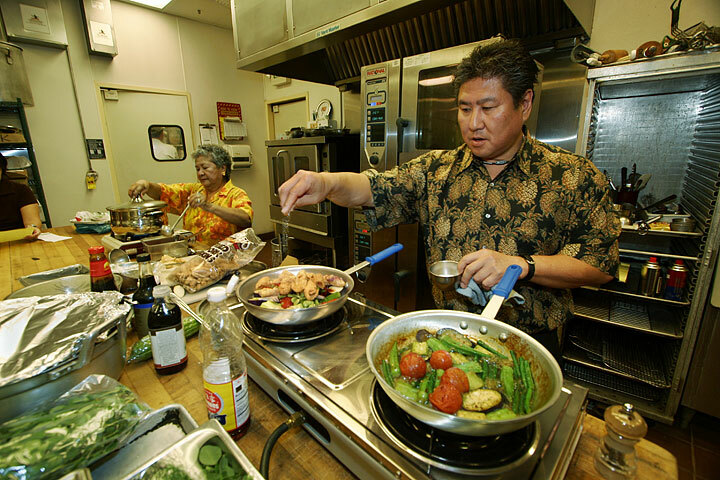 » Korean, Okinawan, Hawaiian, Puerto Rican and Italian flavors will be featured, too. Soak eggplant in water and Hawaiian salt for 30 minutes. Heat a large pot over medium-high heat. Add dried shrimp to hot, dry pot. Add dash of water to lock in flavor. Layer tomatoes, onion, ginger, garlic, salt, pepper and 1 tablespoon bagoong over shrimp. Add water. Reduce heat and simmer until tomatoes are soft, 3 to 5 minutes. Add long beans and stir gently. Cover and cook until beans are half-done, about 3 minutes. Layer lima beans, bittermelon, eggplant (with soaking water) and okra in pot. Break pork rinds into bite-sized pieces; sprinkle over top. Add remaining 1 tablespoon of bagoong and a little more water, if needed. Do NOT stir. Cover and simmer until vegetables settle, about 10 minutes. Intalta -- turn the ingredients by lifting and shaking the pot. Cover and simmer 5 minutes. Serves 8. Approximate nutritional analysis, per serving: 150 calories, 3.5 g total fat, 1.5 g saturated fat, 20 mg cholesterol, 750 mg sodium, 21 g carbohydrate, 8 g fiber, 4 g sugar, 11 g protein. Layer ingredients from beans to stir-fry sauce in cold, dry skillet. Place over high heat. Bring to a boil, then cover for 2 minutes. Add okra and toss. Sprinkle with pepper, chili pepper and about 1 tablespoon more water. Lower heat and simmer, uncovered, until liquid evaporates, about 5 minutes. Serves 1. Approximate nutritional analysis, per serving: 110 calories, 2.5 g total fat, no saturated fat or cholesterol, 750 mg sodium, 19 g carbohydrate, 9 g fiber, 5 g sugar, 6 g protein.